I am not writing the story as it gives away the thrill factor in the movie! Story - screenplay - direction: Prasanth Varma is a classy director. We have seen festival films like Ship of Theseus and Lucie (Kannada) made in other languages and we hardly see any such attempts made in Telugu with capable makers. Awe is such a film. This film has a different format of story telling. The screenplay of the film is excellent. Direction is very good. The director has written the script meticulously and all scenes are interconnected. This film appears like film a film of bold content, but it’s not. This film also appears dragged and out of place in few threads and scenes, but makes sense once it’s all revealed in climax. Since it’s a serious film, the makers have created the characters of Priyadarshi, Nani and Ravi Teja to inject some contemporary comedy (lot of reference to their movies and dialogues). Other departments: Awe! Is esthetically well made film with great technical values. Cinematography by Karthik Gattamaneni is of top notch quality. It’s very glossy and eye pleasing. Music by Mark K Robin is very good. The song that comes during titles explains the theme and characters of the film. It’s very soothing. Background music and sound design are of international standards. Editing is crisp and done with finesse by Gowtham Nerusu. Dialogues are apt. Nani should be patted on his back for backing such a different film with 100% conviction. Production values are excellent. Art direction deserves a special applause. Analysis: Awe is a film for festivals. Awe is a film that should not be seen with the lens of commerciality. It’s a concept based psychological thriller. And will end up as a memorable film as it changes formats in the long run (when it goes from cinema halls, to TV to digital media). 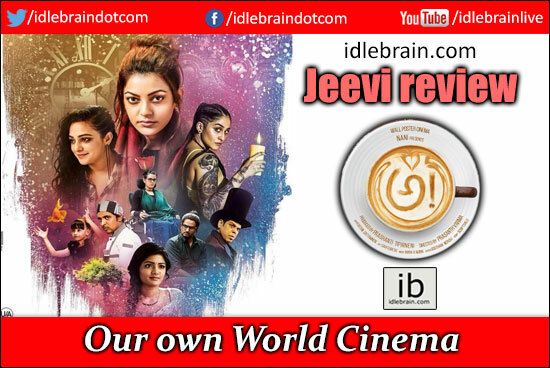 Awe is a Telugu’s answer to world cinema. It’s not for everybody. Watch Awe! without reading or knowing anything about the story! Disclaimer: If you observe the titles keenly, you might get a clue about story. The interval episode has a nice twist and climax has a great twist!